If plugin developers are to be believed, static drum loops that haven't been messed with in some way are to music what vanilla is to the ice cream world. We're constantly being offered tools that enable you to manipulate your beats in some way, the latest of which is SonicXTC's Beat Twist, a new Windows VST plugin that can be yours for free. 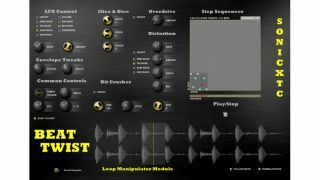 Featuring bit crusher, distortion (with bit reduction) and overdrive units, Beat Twist also sports a selection of 'Slice & Dice' controls and a step sequencer that syncs to your host. You can download Beat Twist for free from the SonicXTC website.